New Rochelle, NY, October 16, 2018–Acupuncture is an increasingly important and effective component of chronic pain management and other areas of care in the Veterans Health Administration (VHA). Over the past 7 years, the number of VHA facilities offering acupuncture has increased from 42% to 88%, according to an article published in a special issue on the use of acupuncture in the Veterans Health Administration in Medical Acupuncture, a peer-reviewed journal from by Mary Ann Liebert, Inc., publishers. Click here to read the full special issue free on Medical Acupuncture website through November 16, 2018. A guest editorial called "Acupuncture and Whole Health in the Veterans Administration," was coauthored by Guest Editors Kavitha Reddy, MD, ABoIM, VA St. Louis Healthcare System, Veterans Health Administration, and Washington University School of Medicine (St. Louis, MO); David Drake, MD, Hunter Holmes McGuire VA Medical Center (Richmond, VA), Integrative Health Coordinating Center (Washington, DC), and Virginia Commonwealth University (Richmond, VA); and Benjamin Kligler, MD, MPH, Integrative Health Coordinating Center (Washington, DC) and Veterans Health Administration (Brooklyn, NY). The Guest Editors point to chronic pain management as a prime example of how "the current model of healthcare delivery is ineffective, costly, and not sustainable," and describe acupuncture as "one of the most promising nonpharmacologic approaches to pain management." In 2015, the VHA partnered with the Department of Defense on a program to train practitioners to perform auricular acupuncture. More than 1700 practitioners have now been trained. This Special Issue includes reports of some of the early outcomes of their deployment. In the editorial entitled "Medical Acupuncture: The Department of Veterans Affairs," contributed by Medical Acupuncture Editor-in-Chief Richard Niemtzow, MD, PhD, MPH, he says, "Acupuncture is becoming well-established in the Department of Veterans Affairs." The VA is expanding and embracing its use of acupuncture, with auricular acupuncture at the forefront, he notes. This special issue details "the acupuncture-research initiatives that clinicians are performing in such areas as: chronic pain; insomnia; pain reduction during colonoscopy; and auricular acupuncture use prior to Botulinum toxin A administration." Dr, Niemtzow states that "Having licensed acupuncturists in the VA system is becoming a reality." 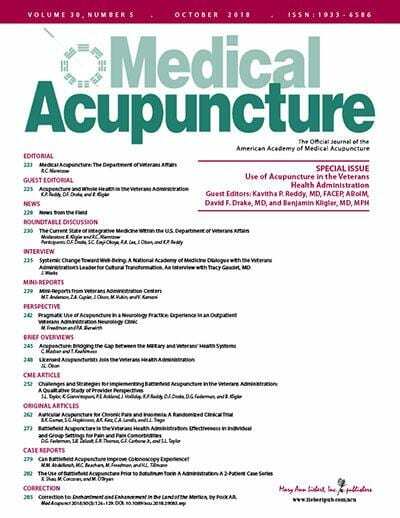 Medical Acupuncture, the Official Journal of the American Academy of Medical Acupuncture, is an authoritative peer-reviewed journal published bimonthly in print and online. Led by Editor-in-Chief Richard Niemtzow, MD, PhD, MPH, the Journal presents evidence-based clinical articles, case reports, and research findings that integrate concepts from traditional and modern forms of acupuncture with allopathic medicine. Tables of content and a sample issue may be viewed on the Medical Acupuncture website. Mary Ann Liebert, Inc., publishers is a privately held, fully integrated media company known for establishing authoritative peer-reviewed journals in many promising areas of science and biomedical research, including The Journal of Alternative and Complementary Medicine, Journal of Women's Health, Journal of Men's Health, and Journal of Palliative Medicine. Its biotechnology trade magazine, GEN (Genetic Engineering & Biotechnology News), was the first in its field and is today the industry's most widely read publication worldwide. A complete list of the firm's 80 journals, books, and newsmagazines is available on the Mary Ann Liebert, Inc., publishers website.